There's something I'd like to add to that. If you're going by train, you need to take three different lines and it takes over two hours. By the time we reached the airport, even Kokone-chan's expression was worn out. That was meant to be a joke, but Kokone-chan suddenly became lively and flashed the peace sign with her fingers. ... I forgot. Kokone-chan has impressive guts and stamina, is highly competitive and hates losing. It seems like she really wanted to walk. Kokone-chan's worn out expression returned. Kokone-chan sighed as she surveyed the area. Just as Kokone-chan said, the spacious airport was deserted. To the point where there seemed to be more airport staff and shop employees than actual passengers. I considered that maybe it was because of the incident, but the planes are flying to their regular schedule, so I guess it's just always like this. Being a fairly new building, it was nice and clean inside, but with a few personal touches. The lobby was quite wide, there was a flower bed containing southern flowers and the open deck facing the tarmac gave it an open feel. Although even with the resort-like furnishings, without any customers it felt quite desolate. Anyway, we headed for the crime scene. The carry on baggage check area was also deserted. There was a line drawn to indicate where passengers should queue, with the inspection platform to the right of it. But there wasn't a single passenger getting their bags examined today. Only a bored looking young inspection officer standing there. I was expecting there to at least be some police examining the crime scene, but I guess not. I suppose they have both their suspect and murder weapon already, so maybe they didn't feel the need to search for anything else. I spoke up to the bored looking examination officer. The inspection officer regarded us with suspicion. He was blunt. But I'm used to this kind of treatment. I spoke politely. The inspection officer's expression became even sterner. “I've nothing to tell you. I'm busy at the moment. ... If this is what he calls “busy”, then a sleeping cat is really busy. Just as I was starting to get desperate. A woman with a small suitcase approached. 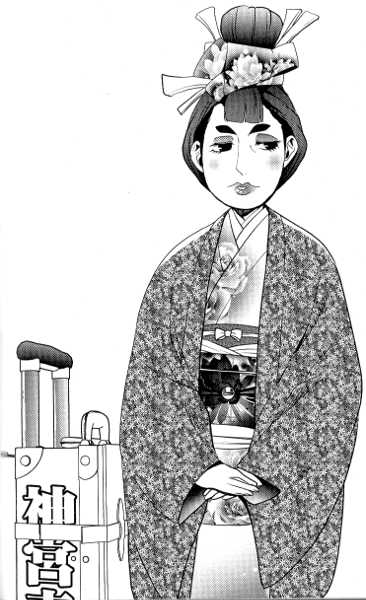 She wore an extravagant kimono and her hair done up with large wooden kanzashi hair ornaments. Her thick make up made it hard to pin down her age, but I'd place my guess at somewhere between 30 and 100. The suitcase she had with her had a large logo reading “Jinguuji Style Master” on it. The woman glared at me and spoke in a shrill voice. Kokone-chan and I moved out of the way. The woman put her suitcase on the examination platform with a thud and spoke to the examination officer. The way she was chewing out the examination officer almost felt as if she were blaming him personally. ... Either way, this woman was apparently planning to catch last night's flight. It seems that because of the murder incident, she had missed her flight and was planning to get another one today. When I spoke up, she turned to look at me and broke into a smile. The expression on her face made her look almost like a different person to before. However, her eyes weren't smiling, they were a little intimidating. ... What. What have I gotten into? I shook my head in a panic. The woman's expression immediately changed to annoyed. The woman brushed us aside and walked through the metal detector, reclaimed her suitcase when it came through inspection and headed for the departure gate. We were unable to enter the area beyond without any plane tickets. It's unfortunate, but we'll have to give up on speaking to that woman. I looked at the inspection officer and he turned the other way, he seems intent on ignoring us. The way he's so reluctant to talk seems suspicious. He would've been the closest witness to the crime. Which means he's got to be one of the witnesses testifying in the trial. He won't be able to give us the silent treatment in court. I'll make sure to draw out every last detail of what he saw. Kokone-chan and I left the carry on baggage inspection area and headed for the exit. The inspection officer wasn't the only witness. Since we came all the way out here, we're going to get all the details we can. As soon as I'd spoken those words. I stopped in my tracks when I heard the familiar voice. Kokone-chan spoke up in surprise as she turned around. Standing behind us with his unsociable expression was my friend and current chief prosecutor – Reiji Mitsurugi. An unexpected face in an unexpected place. No, there's no reason the chief prosecutor would be looking into a murder case. Mitsurugi magnificently dodged the question with his reply. I shook my head and cut him off. Mitsurugi said without a hint of a smile. That said, throughout the many years I've known him, I could probably still count the number of times he's actually smiled. Mitsurugi spoke matter of factly, but I was taken slightly aback. But before I could open my mouth to voice my questions, Mitsurugi spoke. And he walked off without a moment of hesitation. Of course, I didn't bother calling out to him. I knew full well that he wouldn't stop anyway. I spoke as I began walking. Kokone-chan seemed to be talking to herself. Despite her whispering, I replied to her anyway. Kokone-chan has incredible hearing. She can pick up on people's emotions just by hearing their voice, even if they're actively hiding it. Sometimes it's clearer than their actual words. There must be some kind of connection between Mitsurugi and Uranashi-san. Had he done something to piss Mitsurugi off? Meguru-san's home was a ramen shop by the ocean. It was a name suiting a ramen shop in an airport city. While we were heading to the ramen shop, Kokone-chan let out a shout. It was the kind of wind where if you weren't careful would blow you over. Kokone-chan's long hair fluttered in the wind like a carp streamer. I took the opportunity to dish out some knowledge I'd prepared in advance. Indeed... it seems an odd choice to put all that money into putting an airport just anywhere without any real thought. Anyway, we finally reached “Taikuuken”. It was a small shop with an old looking sign. To be quite honest, it looked... worn out. I hate to say it, but it looked as though it might collapse under the force of the strong winds at any moment. Kokone-chan faltered for a moment, but she's a true member of the Naruhodou Anything Agency. She made a strong proclamation. Though I said this, the best way to get the chef to open his mouth was to ask our questions while eating. Despite being the somewhat questionable time of just before three o'clock. As we opened the door we got a lifeless greeting. It was a narrow shop. The counter was in the shape of the letter L with eight legged round stools lined up along it. It may be due to the time of day, but there wasn't a single customer. Behind the counter was a man wearing a T-shirt with long brown hair that was tied back. This must be Meguru Amakake-san. I took a seat and ordered my ramen innocently. The man nodded with a gloomy expression and began to parboil the noodles. I looked around the shop a little before deciding to break the ice. Plastered on the wall was a slightly oily looking menu. Between the sheets of the menu, there were photos of aircraft conspicuously standing out. Both jumbo jets and smaller jets were included. They were all beautiful photos showing them taking off into the grand skies. The man behind the counter curtly replied with a calm whisper. Predecessor, huh...? I knew the place looked old, but apparently it had been running for generations. I decided to just cut to the chase. The man lifted his head and regarded us with suspicion. I spoke in the most amiable tone possible. Meguru-san pulled out and dumped the noodles in a rush (dangerous!) and turned to us in excitement. His speech and behaviour had suddenly changed dramatically. He'd been about as lively as a wet noodle until just a moment ago. Meguru-san's eyes shone as he introduced himself. ... I recall nothing about any elephants. ... Odoroki-kun, what exactly have you been saying behind my back? Meguru-san served up a bowl of ramen with a smile, laying them in front of us. Not only that, but he added a large serving of menma. Meguru-san's voice dropped suddenly, as he gained a serious expression. After making no progress as the airport and Mitsurugi's cryptic warning, I was worried that this investigation wasn't going anywhere, but it seems like Meguru-san will talk to us. Meguru-san had an overwhelming energy, but it's time I got serious. I cut straight to the question. Meguru-san twitched in response to my words. Meguru-san averted his eyes in frustration. ... Good to hear. Meguru-san does believe in Odoroki. He ran his mouth in the heat of the moment and regrets it. Meguru-san furrowed his brow. I decided to bring up something that had been bothering me. Meguru-san gulped. I pressed for an answer. According to Odoroki-kun, Meguru-san had grabbed Uranashi-san's arm with a grim expression... and Uranashi-san had shaken him off and kept walking. Doesn't sound like a friendly greeting to me. I changed my angle of approach. Meguru-san gave an unnaturally quick and definitive response. Meguru-san shouted to cut off the conversation as he added more menma to our bowls. Once again he added more menma. It doesn't seem we'll get anything else out of Meguru-san. We simply ate our menma in silence.